CIA Chief Pompeo And Kim Jong Un Met, Formed 'Good Relationship,' Trump Says : The Two-Way The agency's director recently traveled to North Korea to pave the way for direct talks between the North Korean leader and President Trump. It "went very smoothly," Trump said. 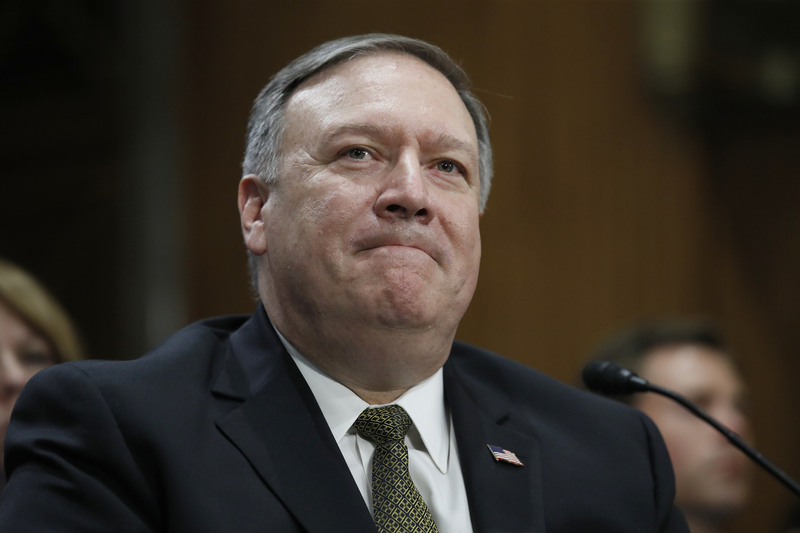 Secretary of State-designate Mike Pompeo pauses while speaking during the Senate Foreign Relations Committee hearing on confirmation last week on Capitol Hill in Washington. CIA Director Mike Pompeo made a secret visit to North Korea earlier this month and met with leader Kim Jong Un — a meeting that "went very smoothly," President Trump said on Wednesday. "A good relationship was formed," Trump said, adding that the direct contact with North Korea — a rare step for the U.S. — was intended to work out details of a possible Trump-Kim summit. In a tweet that also hinted at the ultimate goal of a potential summit, the president added, "Denuclearization will be a great thing for World, but also for North Korea!" In tweeting about Pompeo's trip, Trump confirmed the substance of recent reports by multiple news outlets, which had quoted unnamed White House officials. But Trump also introduced an element of potential confusion, by saying that Pompeo met with Kim "last week." Early reports had stated the secret meeting occurred over Easter weekend — or around April 1 — more than two weeks ago. NPR's Tamara Keith says a White House official has confirmed that Pompeo met with Kim on Easter weekend. The confirmation of Pompeo's trip comes after Trump said Tuesday that the U.S. and North Korea have had direct talks "at very high levels." He made that statement during a joint news conference with Japan's Prime Minister Shinzo Abe from the Mar-a-Lago resort in Florida. Trump said he expected to sit down with the North Korean leader in early June, if not sooner, and that the White House was considering five possible sites for such a meeting. The Washington Post, which first reported the Pompeo visit, noted, "Pompeo has taken the lead on the administration's negotiations with Pyongyang. His meeting with Kim marks the highest-level contact between the two countries since 2000, when then-Secretary of State Madeleine Albright met with Kim Jong Il, the current leader's late father, to discuss strategic issues. Then-Director of National Intelligence James R. Clapper Jr. visited the country in 2014 to secure the release of two American captives and met with a lower-level intelligence official." Pompeo, who is awaiting confirmation to succeed Rex Tillerson as secretary of state, "has been dealing with North Korean representatives through a channel that runs between the C.I.A. and its North Korean counterpart, the Reconnaissance General Bureau, according to other officials. And he has been in close touch with the director of South Korea's National Intelligence Service, Suh Hoon, who American officials said brokered Mr. Kim's invitation to Mr. Trump," The New York Times reports. White House press secretary Sarah Sanders said Tuesday that the two leaders have not yet spoken directly. If Trump and Kim do meet, it would be the first direct talks between a U.S. and North Korean leader. The U.S. played a key role in the bitterly fought Korea War that ended in an armistice – not a peace treaty – in 1953. North and South Korea have technically been in a state of war ever since. Given his harsh words for Pyongyang and its leader, Kim, since taking office — including his threat to respond to Pyongyang's missile tests with "fire and fury" — Trump signaled a more conciliatory note in the news conference with Abe. "I really believe there's a lot of good will. They do respect us. We are respectful of them," the president said. "They do have my blessing to discuss the end of the war," he said. "Subject to a deal, they have my blessing." For his part, Abe, whose country has been a frequent target of North Korea's ire and a would-be target of its ballistic missiles, praised Trump for his "unwavering determination in addressing the challenge of North Korea."